We are already 3 games into the fantasy football semifinals and so far DeAndre Hopkins has been our best performer. Everyone else has been a bit wishy washy to this point. Today should bring some action so let’s take a look at the weather and injuries. Congratulations! You’ve made it through week 14! Maybe you had a bye week and had a chance to rest your players (calm down, it’s a joke). Each week is the most important week of the fantasy season so the rankings and line up questions are more important than ever. I’m here to help you out so let’s get right to it. The first week of the playoffS usually give me about 7 hours of crippling nerves during the afternoon while the match-ups slowly shake out before the final two games. This week is no different. I am in a really close match up as I write this late on Sunday afternoon. It is in my main home league and it’s likely going to come down to Adam Thielen Vs. Allen Robinson. I hope that your match ups went well or you’re at least in a position to get the win tonight. Let’s talk about some of the performances from the Sunday afternoon slate. The fantasy football playoffs started with a bang on Thursday with Derrick Henry getting a ton of bench points for his owners. I saw a couple of people on twitter complaining that they were playing against Derrick Henry. That’s even more brutal because points are theoretically harder to come by in deeper leagues. Are there any Derrick Henry performances around the corner today? Probably not, but Chris Godwin and DJ Moore should be in your lineups if you’re on the fringe of sitting them. It’s playoff time! This week the running back carousel features a couple of new members in Jeffrey Wilson Jr. and Jaylen Samuels. Of course, a football game plan is not nearly that cut and dry. 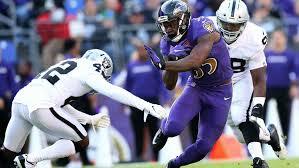 I bet you wish you picked up Justin Jackson instead of Austin Ekeler for last week. Time to find out where I have everybody ranked at this point in the week. All there is left to determine fantasy playoff spots is the terrible NFC East showdown tonight and whatever tiebreaker your league uses. I hope that the results have ended in your favor because I’m rooting for you and I want you to keep clicking in December. As I combed through the scoreboards of the leagues that I play in, scoring seemed like it was a little bit lower than usual yesterday. Well, until Antonio Brown and James Conner stepped onto the field. By the way, the Steelers and the Chargers was the perfect night cap. For me, the night game always leaves a lasting impression for how the football week was. Most of my Sunday afternoons are spent flipping back and forth from the red zone channel to games that have heavy implications for me personally. If I’m watching the red zone channel and Josh Allen pops up on full screen, you better believe that I’m flipping to see what the Panther and Bucs or the Bears and Giants are up to. Watching condensed games is pretty cool and I do that pretty often, but it doesn’t feel the same because I already know the results. My point is, the Sunday night game is the only game of the day that I can get lost in the game flow and the narratives. Let’s get to the results that stuck out in week 13. This week is a play in week for a lot of readers, so it can be looked at as an extra playoff week. I certainly have a couple of leagues that I am looking to make a final push to snag a spot in the post season, including our writer’s league. It’s not looking great thanks to Michael Thomas disappearing on Thursday night. But hey, miracles happen. Your pal Zach is out this week so you have to deal with more of me. The league had a very busy day on Friday with Kareem Hunt being sent home, then being put on the commissioner’s exempt list, and then being cut by the Chiefs all together. Moral of the story, keep your hands and feet to yourself and if you fail to, own up to your mistakes. As for your opinions on what Kareem Hunt’s future should look like, I’m not interested in them. We are one week away from the fantasy football playoffs. Let’s pull off one more victory, shall we? This slate is full of interesting match ups. Let’s get right into the rankings for week 13. That’s right, I am right smack-dab in the middle of a November blizzard. So far, I have shoveled the driveway twice today and it’s probably going to happen a third time. I can’t stress enough how depressing this is considering it was over 50 degrees on Thanksgiving. The terrible thing about being an adult is in the manufacturing industry I don’t think that they have snow days. At least, I have never heard of it. I upgraded my car situation last summer, so that excuse is out the window too. It’s now in the middle of the second quarter of the night game when I am finally getting a chance to start this so I am most likely going to keep it pretty short.